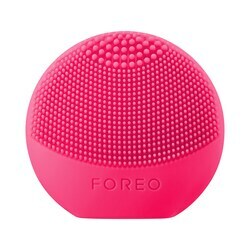 This past month I had the opportunity to participate in the FOREO 10 day skin challenge and test out one of their newest products the LUNA Play. This is their smallest facial cleansing brush in their line and was created to be the most compact and affordable option of the three brushes that they have created. Overall I think that this is a great little device! My top choices of use are for either traveling or if you want to test this kind of brush out. The ONLY downside to this is that I prefer to feel like I am getting a deeper clean than this provides. But, this is honestly perfect for when I am trying to pack lightly when going on a trip and still want more of a deep clean than just my hands or a wash cloth can provide. And with its $39 price tag if you have been wanting to try a sonic cleaning brush but don’t want to spend the $200 for the larger version, this is a great way to see if this kind of brush is right for you! Link to this brush is below. Just an FYI I have this in the hot pink color that is shown above but look at all of the cute colors they have! Pretty colors make everything better, am I right? !